Politicians and activists of the Christian Democratic People’s Party (KDNP) decided that it was time to affix labels to buildings and houses in Budapest that serve as homes to NGOs, which work with legal immigrants and refugees. The stickers affixed to the entrances of these buildings read: “An organization that supports immigration” (Bevándorlást támogató szervezet, in Hungarian). Note that KDNP is not going after NGOs that reach out to undocumented or irregular migrants, but rather every NGO that offers programming to legal immigrants. One such building labelled Thursday morning by party activists was Népszinház utca 16, in the 8th District (Józsefváros). This is the home of an NGO called Menedék–an organization that helps to integrate refugees that have been accepted by the current Hungarian government. KDNP was not bothered by this detail. The other detail that was of no concern to them was that Népszinház utca 16 was one of the so-called Yellow Star Houses (csillagos házak, in Hungarian) as of June 1944. Black signs bearing bright yellow stars of David (with dimensions of 51×36 cm) marked the entrances of apartment buildings in Budapest housing Jews. There were some 1,840 Yellow Star Houses in Budapest, housing more than 170,000 Jews, in cramped, inhumane conditions. Hungarian Jews were essentially being kept under house arrest and were only permitted to leave their buildings during specific hours. A key goal of concentrating Hungarian Jews in these buildings was to expedite their eventual deportation to death camps, although plans to begin this in July 1944 were halted as a result of international protest. Most of the Yellow Star Houses were in four central Budapest districts–namely: Erzsébetváros, Józsefváros, Újlipótváros and Terézváros. The vast majority of these buildings still stand today in Budapest and some bear plaques in memory of the Holocaust. In other cases, one will find Stolpersteins, or stumbling stones in front of the building’s entrance. These are cobble stones bearing a brass plate, with the names of Holocaust victims who lived in the given building, designed by German artists Gunter Demnig. 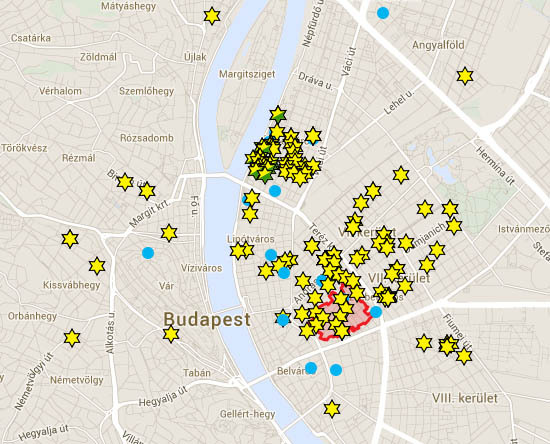 This map marks the location of yellow star houses in Budapest. As KDNP activists like Flóra Tiskóczki affixed their label to Népszinház utca 16, they were either oblivious to the history of Yellow Star Houses in Budapest and specifically to the history of this house, or they are now so desensitized that none of this makes them flinch. When journalists of the 444.hu website asked Gergely Gulyás, Minister of the Prime Minister’s Office, what he thinks about this initiative during the government’s standing Thursday press conference, he simply said that he is good friends with the KDNP politician, István Hollik, who organized this, and refused to offer any comment on the labeling. This is very painful to read. Another “enlightened” country, today’s Hungary proves to be…. sad for everyone who still lives there. If we give these young people the benefit of the doubt and assume that they were just plain stupid, ignorant or blind and unaware of the significance of the Yellow Star…the question remains why it hasn’t now been removed? I think lately with every day that passes, this whole Hungary = Antisemitism angle is becoming more and more ridiculous. I know it has been a common feature of the MSM propaganda, but it is not based on facts today. Fact is that Hungary today is in fact one of the safest countries for Jews in all of EU. 37 antisemitic incidents in Hungary in 2017. In other words, a Jew in UK is 15 times more likely to encounter an anti-Semitic attack, compared with Jews in Hungary. In Hungary Jews feel free to live an openly Jewish life, including public displays that identify them as Jews, and they have the privilege of being able to feel safe attending their place of worship or community centers without the need for armed guards, which is no longer the case in most of Western Europe. Fact is, that trying to tie Hungary to antisemitism over Hungary’s anti-Soros campaign, or the fact that they placed a paper identifying an NGO as helping migrants, is an extreme stretch. The real anti-Semites in Europe are the past few generations of West European leaders who brought in millions of rabidly anti-Semitic people into Europe, making it impossible for Jews to feel safe anymore. They say the proof is in the pudding, meaning that we should stick to hard facts, not this extreme derivation of accusations, needing some extreme interpretations, as done in this article. Don’t blow this out of proportion. If stupidity would be punishable almost all members of the infamous Hungarian ruling party (fidesz/kdnp) would be spending life in prison. It’s that simple. Hitler hat damals nicht nur Juden vergast, sondern alle die, die ihn nicht mochten plus die, die aus anderen Gründen für die Nazis nicht lebenswert waren. At that time Hitler not only gassed Jews, but all those who did not like him, plus those who for other reasons were not worth living for the Nazis. Uk has somewhat of a bigger population than Hungary and its Jewish population is more widespread- Hungary’s is concentrated in Budapest and even there, within 2 districts. But you know what (I hope your head doesn’t explode) your main point is kind of correct. I know some “Young Christian Democrats”and let’s just politely say they are not the brightest of buttons. So their original sticker expedition was not anti-Semitic because, basically, they were too thick to understand the significance of the Yellow Star houses. But after the media storm, they didn’t go back to remove the original mistake? See the problem? Or maybe you don’t think it was a mistake? Be honest. Secondly, what is your opinion on this kind of action? If an organisation has “refugee” or “migrant” in its title, then I guess most people have a fairly coherent idea about their purpose. So, the points of the stickers? A couple of months ago, the pro-Orbanist media printed the names of those working in the NGO sector who had any kind of connection with Soros. Again, to what purpose? Considering, many of those names were folk working as drivers, cleaners, admin staff? In other words, not the kind of folk “smuggling illegal migrants across the border”? What was the purpose of printing those folks names do you think? Do you agree with that purpose? For the record I adjusted the 15x number to reflect UK’s larger Jewish population, otherwise there were in fact 37x more attacks in UK. As for the yellow stars, elementary school teachers hand out yellow star stickers for homework and quizzes, as a sign that it was good work. Are they Nazis? Going with the logic displayed here, I’d say yes! Peter, Orban’s domestic antisemitism (only in Hungarian) is finally getting more attention in the West. He openly praised Horthy who is responsible for the murder of hundreds of thousands of Hungarian Jews, also praised Albert Wass who depicted Jews as rats, falsified Hungary’s Holocaust history, endorsed statues of pro-Horthy fascists like Janos Esterhazy and Ferenc Koszorus… His regime published falsified statistics of antisemitic incidents and hired Israeli lobbyists in Washington DC to cover up his rampant domestic antisemitism… which helps to keep him in power…. It won’t work. It is high time that US politicians take some field trips to Hungary to see Orban’s Horthy, Wass, Koszorus etc. statues and the ongoing cynical humiliation of Holocaust survivors and their children..
1) Blaming Horthy for the murder of hundreds of thousands of Jews is a stretch in terms of historical interpretation, given that the events you refer to happened after Germany in effect took control of Hungary, therefore decisions no longer belonged to the Hungarian authorities. 2) Nothing you described here is in any way more despicable than Junker recently praising Marx, during the placing of a statue of him in Germany, whose ideology is responsible for 100 million deaths in the 20’th century. I am personally a supporter of leaving the 20’th century behind and dealing with present day issues, in a world that is very different from that world. Statues are about history, and when it comes to history, it seems some people think Marx who is responsible for an ideology that led to 100 million deaths has merits in some ways. Some Hungarians will see Horthy as worthy, because he tried to return some regions that had an ethnic Hungarian majority to Hungary, which was justice for Hungarians that you perhaps would understand better if you would have lived as an ethnic Hungarian in Ukraine for instance. The French will raise statues to the butcher of the 19’th century, namely Napoleon. If we were to only raise statues to perfect leaders and historical personalities, we would have no statues. Horthy was the first European leader that introduce Jewish laws. Hungary used Jews as worker arms to build trenches, they were just cannon fodder. Before the Hungarians were occupied by the German, the Hungarian police kidnapped several thousand Jews, because they could not identify themselves, and shot them. The Arrow Cross was even before the German occupation and the German occupation took place within a few days. If the Hungarian Nazis had not drunk so much wine with the German Nazis, Hungary would have been occupied within a day. Yes, except Mr. Lazar claimed Horthy was responsible for the crimes committed after the German occupation,while historical evidence says otherwise. At some point Horthy even ordered the police to open fire on German forces rounding up the Jews, so he did in fact resist their deportation. 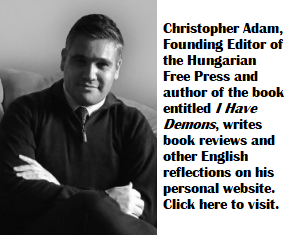 All crimes committed before then belong to the Hungarian authorities. I never denied that! But I am sure that even author of this article, who has a degree in History will agree that one has to be fair in drawing conclusions based on the evidence, not based on bias. The cowardly Hungarians have never been to blame for anything … right? Mr. Lasar was right after all, Horthy instigated all this! I can’t believe you have written that. I see you left the question of whether the pro-State media are justified in publishing the names of NGO workers and staff well alone. Do you agree with that stigmatisation? Do you agree with the fact that the self-same Pro Orban media have published a black list of “liberal” academic members of the Hungarian National Academy? Is that a justified form of political discourse?